"A hilarious children book that will provide parents with at least as much fun as their kids, while delivering a wealth of imagery and active exploits that's certain to fuel curiosity and provoke discussions about contemporary social and familial life. Highly recommended!" The Columbia Review. Aunt Betty lives with Aunt Jane. Aunt Betty is Mother’s sister. Aunt Jane is not a relative. Aunt Betty and Aunt Jane live in a big, swanky apartment. They have 16 telephones and a hot tub. My father calls them “old maids,” but this is not true. They have a maid. Her name is Shirley. And from here, the book is off to a brilliant start. The adult characters ‘work’ in business, law, arts, and everything in-between, and the young main character observes the world around her with keen interest and perception that’s both childlike and wise beyond her age—in a believable way. The story artfully mixes realistic life threads with fantasy, absurdity, and anarchy—such as an intense courtroom fight over the rights of unicorns—resulting in a marvelous tapestry of characters, scenes and conflicts. The author has done a particularly great job at creating parallel layers of humor, allowing for ‘adult entertainment’ without hindering the effective storytelling experience for the innocent youngsters, and making insightful commentary on the hot issues of the day without encumbering the delightful storyline. Topping it all are funny, rich and clever illustrations that match the spirit of the book yet add a whole new level of joy for the reader. 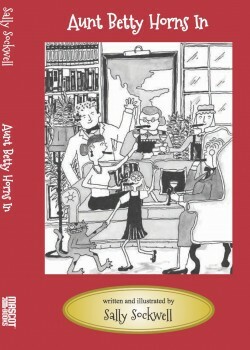 In summary, “Aunt Betty Horns In” by Sally Sockwell is a hilarious children book that will provide parents with at least as much fun as their kids, while delivering a wealth of imagery and active exploits that’s certain to fuel curiosity and provoke discussions about contemporary social and familial life. Highly recommended!